The entire family has accepted the calf and agree that it behaves like the woman's husband. Love for animals is an important sentiment prevalent among several people across the world, but some people seem to take things to a new level. While bovines have been getting a lot of attention from people in India, a woman in Cambodia is leaving everyone behind with her affection for a calf. 74-year-old Khim Hang has married a calf who she believes to be a reincarnation of her deceased husband Tol Khut. The heartbroken lady who lost her husband a year back said that her husband’s soul came to her followed by the calf licking her hair, neck and then kissing her which was enough to convince Khim Hang that it’s her husband. Khim Hang says that the five-month-old calf does everything including going upstairs in the house just like her husband did. Her children are also convinced that the calf is their father from his behaviour with relatives and Khim Hang’s grandchildren. 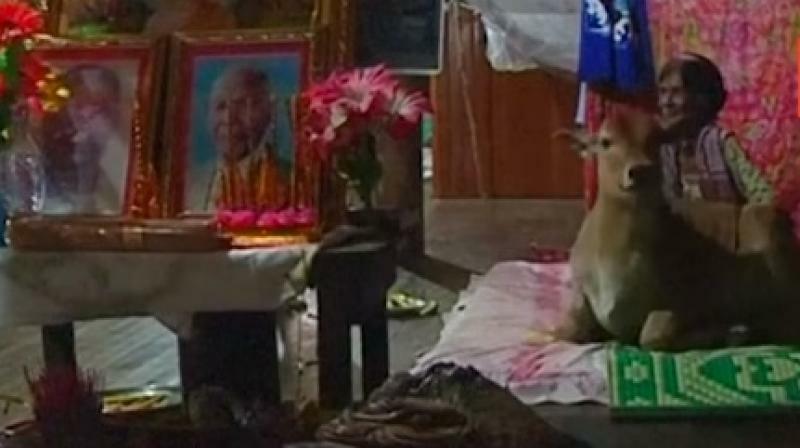 The family tucks the calf in bed and it sleeps with Tol Khut’s favourite pillow as Khim Hang has vowed to care for it till her death and asked her children to care for the calf after her death. People from all over the country have been flocking to their house to see how the calf stays with the family.